A project to investigate prehistoric “round mounds” on the Isle of Man began this autumn, led by Dr Rachel Crellin at Leicester University and Dr Chris Fowler at Newcastle University. The mounds were built over human burial sites and are found throughout the British Isles and in Continental Europe. First appearing in the Neolithic, round mounds were constructed periodically into the Bronze Age. Over 160 round mounds have been identified on the Isle of Man, with four excavated between 30 and 60 years ago. No modern research using systematic survey and excavation has ever been carried out. Alongside geophysical surveys of Manx round mounds and landscape analyses using LiDAR imagery, a new assessment of Neolithic and Bronze Age mortuary evidence from the island will be completed. As part of this last component, Dr Michelle Gamble carried out an osteological assessment of human remains from historic excavations preserved in the Manx National Heritage collections. This has revealed some intriguing artefacts. A stone cist at Staarvey Farm on the island, excavated in 1947, contained two Collared Urns, a plano-convex flint knife, a flint scraper and cremated bones. In amongst these bones lay a small pommel, not noticed by excavators. 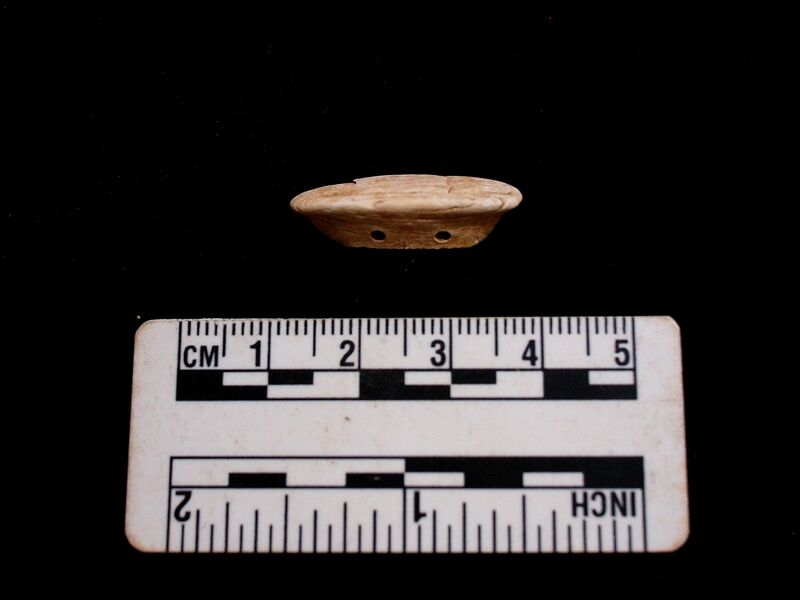 Originally made to fit on to the handle of a bronze knife, this is one of only about 40 surviving the Bronze Age from the British Isles – none having been previously found on the Isle of Man. It is made from bone, and further analysis may be able to identify which species of animal it was made from.